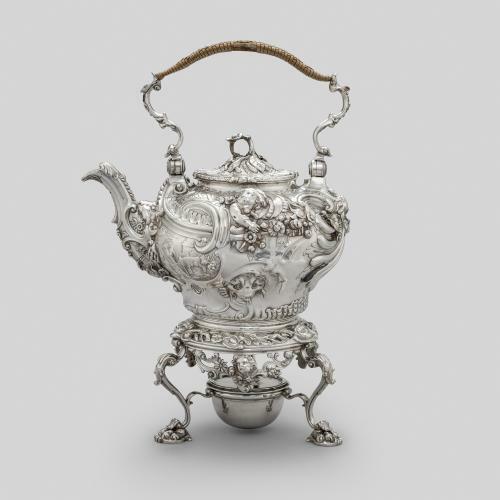 Silver kettles first appeared at the end of the 17th century and served to replenish empty teapots, which were small at this time. 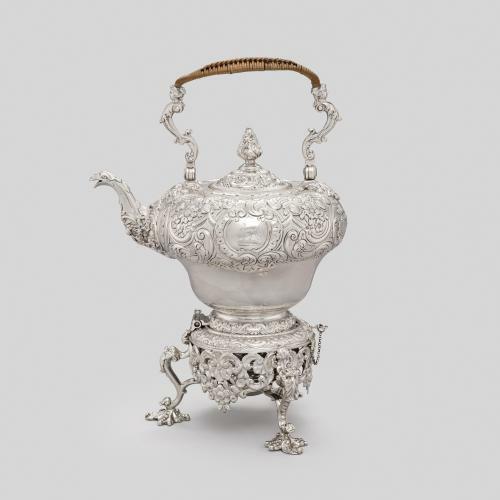 To keep the water hot, they were supplied with stands fitted with a spirit burner that warmed the underside of the kettle, allowing the silver to act as a heat conductor. The handles were usually made of wicker or wood, or with ivory disk inserts that provided insulation from the boiling water. 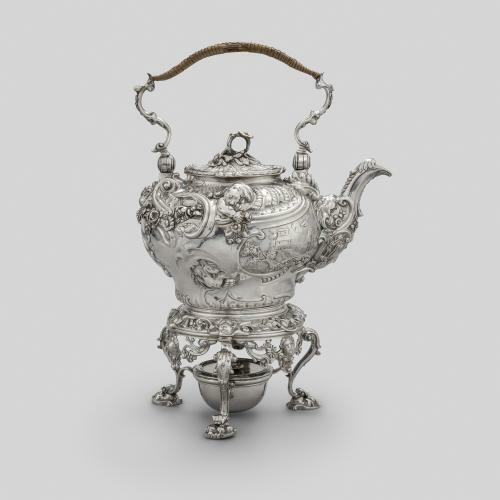 Due to the weight of a full kettle, they were often positioned next to the tea table on a stand and used with the assistance of a servant. 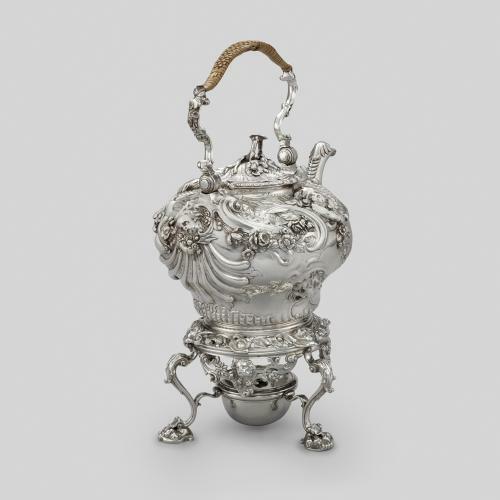 As such large and impressive silver items, kettles became a focal point of the tea ceremony and an obvious expression of wealth. Up until the 1730s, they were usually plain and of simple form, but the influence of Rococo taste transformed them into a vehicle for extravagant ornament. 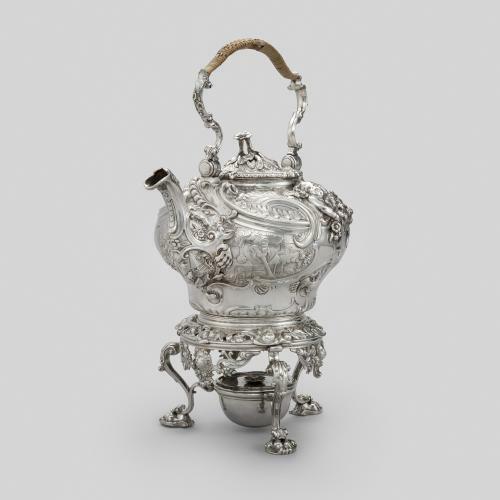 This kettle and stand was made by the Huguenot silversmith Paul de Lamerie who is known for his inventive and spectacular pieces of silver. His use of bold and imaginative forms were often informed by the Rococo style. 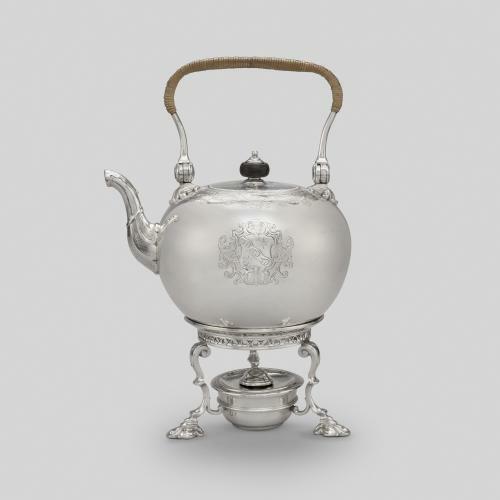 While the kettle is not engraved with a crest or coat-of-arms, the 1927 Leicester-Warren sale in which this kettle was sold also included a pair of small oval trays with similar decoration also by Paul de Lamerie. These are engraved with the contemporary arms of Leicester for the 4th baronet, which suggests that the kettle may also have been commissioned by him.